Prepare the corn. this took some time but well worth it. Cut the kernels off four of the ears of corn. use a chef’s knife to cut downwards along the ear. You don’t want to go so deep that you get any cob, just nice juicy kernels of corn. Set aside, you should have roughly 3 cups. Milk the remaining six ears and the cobs you cut the kernels off. To do this use the coarsest side of your grater and grate the corn off. Then use the back of your knife to scrape off any remaining pulp and juice. You should have about 2 cups of pulp and corn juice. I gave it a buzz in a food processor. In a heavy deep pan like a Dutch oven or stock pot, heat to low and then add the butter and onions. Cover and cook until softened about 12 minutes. Add the minced garlic and sauté one minute. Then you’re going to make a roué by adding the flour and whisking it in. Then slowly add the stock whisking as you go. 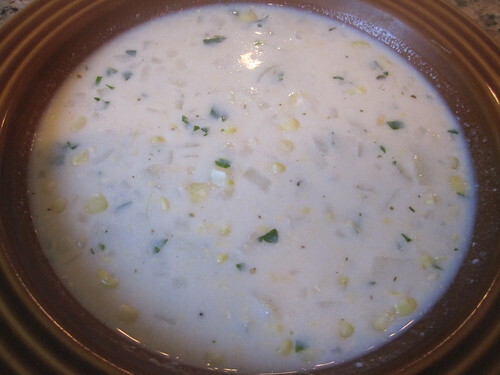 Add the potatoes, thyme or oregano, milk and corn pulp Bring to a simmer. Reduce the heat to medium-low and simmer gently until the potatoes are almost tender, 8-10 minutes. Now add in the corn kernels and return to a simmer; simmer until the corn kernels are tender yet still slightly crisp, about 5 minutes.